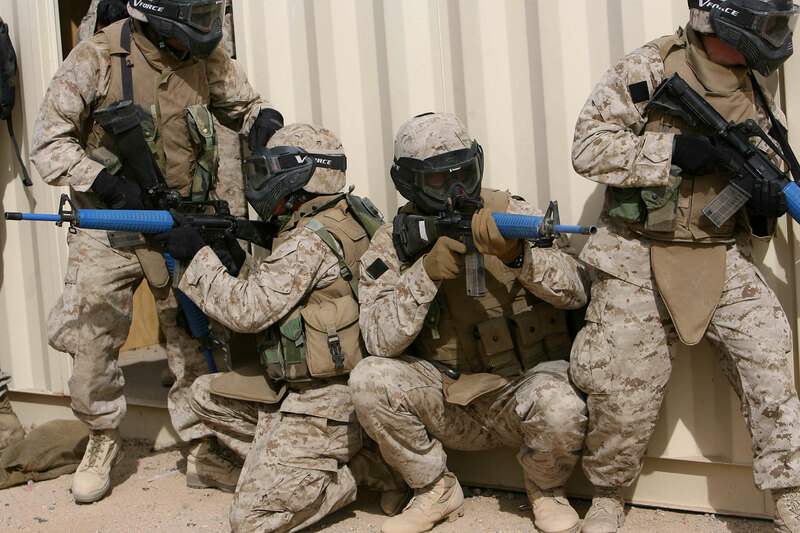 In my first installment on JADE HELM 2015 we looked briefly into Unconventional Warfare, which is the characterizing nature of the design of the JADE HELM 2015 exercises. Because JADE HELM 2015 (JH15) is a military exercise on the surface and a psychological operation beneath its surface, we also looked at the basic notation of Twentieth Century warfare, which was primarily “Conventional Warfare”. We noted that at the end of each of the Twentieth Century’s three great wars, (two “World Wars” and one “Cold War”), there were no “enemies” left to threaten America. Yet we also noted that after each of the three major wars, after America had conquered her latest “enemy”, somehow, miraculously, a new “enemy” emerged, right on time. We noted some observations about the military-industrial complex. We saw that after our victory in the Cold War (1991) a new “enemy” was needed but that international tensions were too high to risk an overtly declared war against any non-aggressing nation-state, leaving the Power Elite’s world planners with only “people” to target for war. That of course surfaced as the so-called “War on Terror”, which was sold to the world on engineered perceptions in response to several peak-effect “terrorist attacks” which conveniently happened after the USSR dissolved. Speaking about terrorism here in America, there was the 1993 WTC bombing, the 1995 Oklahoma City Federal building bombing, and the attacks of 9/11/2001. Interestingly, there exist numerous valid questions surrounding each of those events — but, such questions aside, and taken only at face value, the three peak “terrorist” events produced reactions within America’s governance which have caused our government to attack our country’s founding legal documents — and our liberty. Also in part one we noted that the militarization of our local police and the pre-positioning of military/battlefield equipment around the country has been reported in Smalltown, USA. In this installment we will look first at more items of interest found in the Army’s 2008 manual on Unconventional Warfare and then begin to move into MindWar. Because of the sheer size of the phenomenon, we will only introduce MindWar in this installment and go more deeply into MindWar in part three of this series. Apparently Unconventional Warfare concerns itself with the correlation and interface of various components of NATIONAL POWER, and with how those components are to be used to sustain and expand NATIONAL POWER so that no other POWER on earth can possibly OVERPOWER two national things: 1) U.S. national “interests”, and 2) U.S. national security. 1-1. The intent of U.S. UW efforts is to exploit a hostile power’s political, military, economic, and psychological vulnerabilities by developing and sustaining resistance forces to accomplish U.S. strategic objectives. Historically, the military concept for the employment of UW was primarily in support of resistance movements during general-war scenarios. While this concept remains valid, the operational environment since the end of World War II has increasingly required U.S. forces to conduct UW in scenarios short of general war (limited war). 1-2. Enabling a resistance movement or insurgency entails the development of an underground and guerrilla forces, as well as supporting auxiliaries for each of these elements. Resistance movements or insurgencies always have an underground element. The armed component of these groups is the guerrilla force and is only present if the resistance transitions to conflict. The combined effects of two interrelated lines of effort largely generate the end result of a UW campaign. The efforts are armed conflict and subversion. Forces conduct armed conflict, normally in the form of guerrilla warfare, against the security apparatus of the host nation (HN) or occupying military. Conflict also includes operations that attack and degrade enemy morale, organizational cohesion, and operational effectiveness and separate the enemy from the population. Over time, these attacks degrade the ability of the HN or occupying military to project military power and exert control over the population. Subversion undermines the power of the government or occupying element by portraying it as incapable of effective governance to the population. For nearly five decades, America’s role in the military coup that ousted Iran’s elected prime minister and returned the shah to power has been lost to history, the subject of fierce debate in Iran and stony silence in the United States. One by one, participants have retired or died without revealing key details, and the Central Intelligence Agency said a number of records of the operation — its first successful overthrow of a foreign government — had been destroyed. But a copy of the agency’s secret history of the 1953 coup has surfaced, revealing the inner workings of a plot that set the stage for the Islamic revolution in 1979, and for a generation of anti-American hatred in one of the Middle East’s most powerful countries. The document, which remains classified, discloses the pivotal role British intelligence officials played in initiating and planning the coup, and it shows that Washington and London shared an interest in maintaining the West’s control over Iranian oil. The operation, code-named TP-Ajax, was the blueprint for a succession of C.I.A. plots to foment coups and destabilize governments during the cold war — including the agency’s successful coup in Guatemala in 1954 and the disastrous Cuban intervention known as the Bay of Pigs in 1961. In more than one instance, such operations led to the same kind of long-term animosity toward the United States that occurred in Iran. The history says agency officers orchestrating the Iran coup worked directly with royalist Iranian military officers, handpicked the prime minister’s replacement, sent a stream of envoys to bolster the shah’s courage, directed a campaign of bombings by Iranians posing as members of the Communist Party, and planted articles and editorial cartoons in newspapers…. Two days after the coup, the history discloses, agency (CIA) officials funneled $5 million to Iran to help the government they had installed consolidate power. The CIA was only six years old in 1953, when British Intelligence, working on “interests” of British Petroleum (“BP” — have you noticed BP gas stations in your town?) approached our government and requested that the fledgling CIA help them get rid of a U.S.-friendly and democratically-elected Prime Minister of Iran, to protect oil interests for British and American oil giants. And they did it. That marked the beginning of middle-east hatred for our beloved General government, and the CIA has continued to meddle in middle-east affairs ever since, finally turning the middle-east into the caldron it is today. Do you want to create an enemy? That’s easy — just go bomb a country which had been friendly and had been selling products to you for decades — it’s a natural fact that the peaceful, non-aggressing country you bomb will harbor a stinging resentment. That is what is behind the “Iran Hostage Crisis” which confronted President Jimmy Carter in 1979. We (CIA and corporate “interests”) did it — for corporate greed. What that narrows down to in reality is a major international war crime, which is exactly why CIA kept it all “secret” for almost a half-century. I urge anyone doubting what I’m saying in this series of articles on JADE HELM 2015 to hit that link above and read it for oneself. Then check out how we did the same thing the following year in Guatamala, And then study into the remarkable deception of a U.S. President by Allen Dulles, General Cabal, and Richard Bissell regarding the upcoming “Bay of Pigs” fiasco/scandal. The history of our “National Security State” is deplorable, was done without the American citizens’ knowledge, was lied about by Presidents, and fed the coffers of banksters on Wall Street while ensuring that there would be plenty of “enemies” to keep the military-industrial complex busy. It is a record of crime committed on a massive scale, in our name, and largely funded by unwitting American tax payers (with plenty of cash from covert Black Budget international drug-smuggling activity by CIA’s “surrogates” thrown into the funding mix). I did mention in part one that I must take the reader “around the block” to lay in some background of hidden history which is absolutely necessary for portraying accurately what is behind JADE HELM 2015. As we will see before I’m done the entire middle-east problem has been deliberately engineered by geniuses of “foreign policy”, military planners, industrial greed-mongers, the “too big to jail” Wall Street banks and their pals over at the Federal Reserve, among a sordid cast of lesser players. A really good place to look has already been published here at Oath Keepers in my article on John B. Wells’ Caravan To Midnight interview of Patrick Wood, who has published the bombshell book entitled “Technocracy Rising“. Let’s now look at another peak event of 1979, which parallels President Carter’s difficulties with Iran. 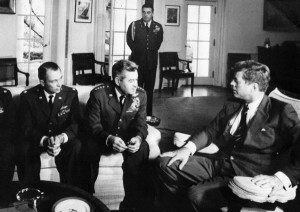 In the summer of 1979 President Carter, America’s first Trilateralist President, discussed Afghanistan with the man who had groomed Carter for the White House, the Rockefeller puppet named Zbigniew Brzezinski, (co-founder of the Trilateral Commission) whom Carter had placed in his Cabinet as “National Security Adviser”, an obvious reward for Brzezinski’s help in getting Carter elected. At the same time, the Army’s role in post-Cold-War military operations remains the measure of American geopolitical commitment. To preserve American military preeminence in the coming decades, the Department of Defense must move more aggressively to experiment with new technologies and operational concepts, and seek to exploit the emerging revolution in military affairs. Information technologies, in particular, are becoming more prevalent and significant components of modern military systems. These information technologies are having the same kind of transforming effects on military affairs as they are having in the larger world. The effects of this military transformation will have profound implications for how wars are fought, what kinds of weapons will dominate the battlefield and, inevitably, which nations enjoy military preeminence. Any serious effort at transformation must occur within the larger framework of U.S. national security strategy, military missions and defense budgets. The United States cannot simply declare a “strategic pause” while experimenting with new technologies and operational concepts. Nor can it choose to pursue a transformation strategy that would decouple American and allied interests. A transformation strategy that solely pursued capabilities for projecting force from the United States, for example, and sacrificed forward basing and presence, would be at odds with larger American policy goals and would trouble American allies. Further, the process of transformation, even if it brings revolutionary change, is likely to be a long one, absent some catastrophic and catalyzing event – like a new Pearl Harbor. Domestic politics and industrial policy will shape the pace and content of transformation as much as the requirements of current missions. “In brief, for the United States, Eurasian geostrategy involves the purposeful management of geostrategically dynamic states and the careful handling of geopolitically catalytic states, in keeping with the twin interests of America in the short-term preservation of its unique global power and in the long run transformation of it into increasingly institutionalized global cooperation. To put it in a terminology that hearkens back to the more brutal age of ancient empires, the three grand imperatives of imperial geostrategy are to prevent collusion and maintain security dependence among the vassals, to keep tributaries pliant and protected, and to keep the barbarians from coming together.” – Zbigniew Brzezinski, 1998. “Vassals”, in the eyes of the War Hawks, include oil-producing nation-states and proximal regional nation-states of Eurasia. When these mind-warped idiots speak of “security” they use that word to denote total control over the vassals, making sure that said vassals remain “dependent” on that security. To insure that the vassals are dependent they send in the CIA and follow-up with ARSOF “surgical strikes” and Psy-Ops. To keep the trade lanes open for the multi-national corporations which are the unspoken “Interests” part of the term “American Interests”, their doctrine is to deploy the U.S. military to “keep tributaries pliant and protected”. As for who the “barbarians” may be, well, I’ll give the reader three guesses, right? Theater-centric, “barbarians” can be nation-states, and domestically “barbarians” can be the dissenting, Constitution-supporting American citizenry, for whom the Army is now training in disciplines for practicing how to use the force of the U.S. military married to State and Local Law Enforcement to manage and contain “Civil Unrest”. As the late Michael C. Ruppert once said, “If you want to get really mad, buy this book. describes the techniques that are used by Army forces who are conducting civil deterrence or response missions to civil disturbances. In the past century, there have been countless examples of civil disturbance situations around the world. The size and scope of these civil disturbances varied from small gatherings of people who were verbally protesting to full-blown riots that resulted in property destruction and violence against others. Over the past decade, law enforcement and professional experts have come to understand crowd dynamics. A better understanding of human behavior and crowd dynamics and technological advancement has led to improved responses to crowd control. This publication covers a wide array of information that concerns civil disturbances along with the techniques that are used to quell or disperse those who are causing the disturbance. This publication discusses crowd dynamics and human behaviors, crowd types, control force basic equipment requirements, and control force formations. This publication also discusses planning requirements and recommendations and the legalities that are involved with civil disturbances and control forces. Remember — when looking at JADE HELM 2015 we’re talking about Unconventional Warfare, Irregular Warfare, Psychological Operations, Special Warfare, and now the military’s bright idea that somehow it is supposed to step in and back-up law enforcement if the “barbarians” decide they do not want the General government dragging this country into the power-elite’s ideological New World Order via a one-world government. We had originally planned, when our study was initiated, to address ourselves to these two broad questions and their components: What can be expected if peace comes? What should we be prepared to do about it? But as our investigation proceeded, it became apparent that certain other questions had to be faced. What, for instance, are the real functions of war in modern societies, beyond the ostensible ones of defending and advancing the “national interests” of nations? In the absence of war, what other institutions exist or might be devised to fulfill these functions? Granting that a “peaceful” settlement of disputes is within the range of current international relationships, is the abolition of war, in the broad sense, really possible? If so, is it necessarily desirable, in terms of social stability? If not, what can be done to improve the operation of our social system in respect to its war-readiness? The word peace, as we have used it in the following pages, describes a permanent, or quasi-permanent, condition entirely free from the national exercise, or contemplation, of any form of the organized social violence, or threat of violence, generally known as war. It implies total and general disarmament. It is not used to describe the more familiar condition of “cold war,” “armed peace,” or other mere respite, long or short, from armed conflict. Nor is it used simply as a synonym for the political settlement of international differences. The magnitude of modern means of mass destruction and the speed of modern communications require the unqualified working definition given above; only a generation ago such an absolute description would have seemd utopian rather than pragmatic. Today, any modification of this definition would render it almost worthless for our purpose. By the same standard, we have used the word war to apply interchangeably to conventional (“hot”) war, to the general condition of war preparation or war readiness, and to the general “war system.” The sense intended is made clear in context…. Please note that I am not implying that The Report From Iron Mountain is an authentic government-sponsored study. That has been debated ever since it was published in 1966. I would however suggest that readers take into account the masterful philosophical assessment (and an accounting of various published comments in England and America regarding same) given the world by G. Edward Griffin in his book, The Creature From Jekyll Island, in which he notes that whether authentic or merely a spoof of Govlish satirical candor [my wording, EA, editor], if one holds the Report in one hand and today’s newspaper headlines in the other hand a certain parallel exists as self-evident and obvious. While Unconventional Warfare is but one facet on the polished gem of Defense Department operations, Unconventional Warfare is now a reality for the several States of the American union, and that is because, from the military planners’ perspective of emotional detachment from moral (and spiritual) considerations in using the INSTRUMENTS of NATIONAL POWER, the practical aspects of MindWar are mirrored in JADE HELM 2015. All of us — all Americans — are part of the Global Human Domain and thereby fall under the surveillance state’s targeting of all humans “anywhere/everywhere” in the world. We must note, even emphasize, the fact that the U.S. military is an arm of the General government in WDC. We see clearly that Unconventional Warfare doctrine is focused on “NATIONAL POWER”. Sadly, we note that nothing in UW doctrine concerns itself with STATE POWER, or with INDIVIDUAL POWER. It only is concerned with NATIONAL POWER. I would submit that military planners and private-sector Defense contractor planners (think tanks and such, as we will see below) totally overlook some basic facts of our Union. We The People created the several States, and, acting through the several States subsequently created the General government. All purpose assigned to the General government created by our Constitution is to protect God-given unalienable rights of every Individual within the united States in compact. The Constitution does not authorize a standing army to presume that the Union of States somehow negates State sovereignty. Indeed, as fellow Board member Sheriff Mack’s Supreme Court victory over the Clinton Administration in 1997 reports, the Constitution created a “system of dual sovereignty“, recognizing the proper historic role of the States which, after all, created the General government for their purposes, which, again, was to protect Natural God-given unalienable Rights of all the Individuals in each of the several States. Yet the military-industrial complex totally overlooks that perspective, and because that complex overlooks the reality of our history it can satisfy itself in simply focusing on NATIONAL POWER while excluding any consideration of the several States and their respective POWER and also excluding your and my right of INDIVIDUAL PERSONAL POWER. military power to successfully conclude two world wars and provide the credibility required to win a third (albeit “Cold”) war. The late 20th century understood the fullest manifestation of actual (or potential) war thus defined as the large-scale mobilization and total commitment of massive organizations wielding immense destructive power. weapons. Moreover, not all modern enemy competitors are synonymous with nation-states. Ah, yes! Since America is the dominant military-industrial force on the planet, no other nation on earth is stupid enough to provoke us into a “Conventional” war. We can readily see that this situation greatly reduces the need for a standing army, or at least it reduces the need for current levels of empowerment, current size of the military, and current levels of budgetary blessings bestowed upon the Pentagon courtesy of the American tax payer. Note: there was, after all, no “Peace Dividend” which the whole world had expected after our victory over the USSR in the Cold War in 1991. The Cold War ended with the dissolution of the USSR, so the world could breathe easier and enjoy a period of peace, yes? But we must now ask, “What does that mean for the “industrial” part of the military-industrial complex?” Recall that in part one of this series we noted that the American economy (and its manufacturing base) is significantly dependent upon production of war-fighting equipment — planes, ships, tanks, “things that go boom in the night”, and such. Any sharp decrease in that sort of production is bound to affect negatively our economy to one degree or another, and would threaten to send our nation’s economy back toward the Great Depression of the 1930s. I would suggest that global planners and American so-called “Leaders”, such as Presidents and their Cabinets, Departments, Agencies, assorted politicians, powerful corporate executives, and the Department of Defense itself, became, after the dissolution of the USSR, dependent upon “competitors” who are not “nation-states”. Their template had been established with the co-called “War on Drugs” decades earlier. So here is their rationale for turning to the highly-secret dark knights of the National Security State (NSS), i.e., the black-ops underbelly of the Intelligence Community, in hopes they could produce “non-nation-state competitors” to continue an imagined need for goods produced and distributed by the military-industrial complex. 1-4. International actors in the current era have awakened to the potential of such “unconventional” methods for compelling an enemy to do one’s will. Avoiding the advantages of U.S. military power, these international actors seek to erode the ability of the United States to employ that comparative advantage. Using the other instruments of power—especially the informational—they seek to employ what is variably referred to as “irregular,” “asymmetric,” or “unrestricted” warfare. Even when violence is joined, direct methods are generally avoided for the classic techniques of guerrilla warfare, terrorism, sabotage, subversion, and insurgency. The military planners are saying that the global supreme power, that is, the US government with its elaborate private-sector corporate contracting community, its Intelligence community which works with other nation-state Intelligence communities such as MOSSAD and MI-6, its military products manufacturing capability, its world-wide massive media propaganda apparatus, its NGOs such as the Council on Foreign Relations (CFR) and the Trilateral Commission (TC), its grip on public education systems top to bottom, its fiat-currency-printing Federal Reserve System which manufactures and manipulates this nation’s currency supply, and other assets — this composed, compounded, and interfaced infrastructure of government assets which comprise the “INSTRUMENTS OF NATIONAL POWER” — could, if residing in the wrong hands, morph our cultural and societal institutions into mindless TV-addicted eddies of pro-Imperialist norms such as we’re already seeing in the forms of 501-C_ corp0ratized churches or professional sports addiction or myriad other distractions, entertainments and stresses of day-to-day routine living in America. Dissent now falls outside the hypnotized norm. Irregular tactics are the only tactics with which to strike blows against the Empire. It never occurs to the military planners, nor indeed to all Federal agencies and departments which seek to control every aspect of our personal lives and to formulate the constructs of our very perception and mentality, that Americans have a right to regulate the activity of such governmental institutions. This product is one of a series of intelligence assessments published by the Extremism and Radicalization Branch to facilitate a greater understanding of the phenomenon of violent radicalization in the United States. The information is provided to federal, state, local, and tribal counterterrorism and law enforcement officials so they may effectively deter, prevent, preempt, or respond to terrorist attacks against the United States. Federal efforts to influence domestic public opinion must be conducted in an overt and transparent manner, clearly identifying United States Government sponsorship…. The possible passage of new restrictions on firearms and the return of military veterans facing significant challenges reintegrating into their communities could lead to the potential emergence of terrorist groups or lone wolf extremists capable of carrying out violent attacks…. DHS/I&A assesses that rightwing extremists will attempt to recruit and radicalize returning veterans in order to exploit their skills and knowledge derived from military training and combat. These skills and knowledge have the potential to boost the capabilities of extremists—including lone wolves or small terrorist cells—to carry out violence. The bitter truth is that if any American citizen believes that the Constitution is the highest uncontested law of the land he is seen by the very government that Constitution created as a “potential terrorist, extremist, and threat to law enforcement”. Now let’s add one more little section from the Army’s 2008 manual on Unconventional Warfare. ARSOF have distilled the definition below to highlight the essentials of UW and eliminate the nonessential. In this era of definitional and conceptual change, ARSOF—and its joint, interagency, and multinational partners—must be unified with a clear and concise understanding of the UW core mission. Operations conducted by, with, or through irregular forces in support of a resistance movement, an insurgency, or conventional military operations. Operations (U), and FM 3-05.201. Note: “clandestine and/or covert…. 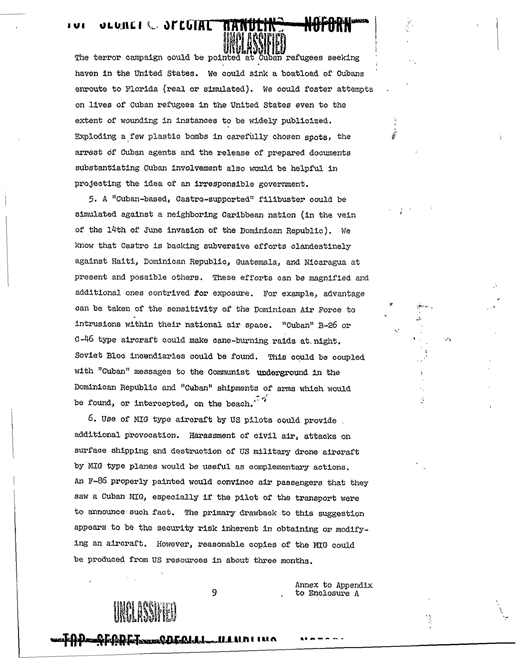 the conduct of classified surrogate operations…” In other words, when our government uses criminals of various types including “terrorists” to do things which can provoke a desired public reaction once the dirty deed has been publicized in the mainstream media with the proper government spin on it, but the government must not let the American people know that the government itself planned and executed the “terrorist event” using surrogates, the government dutifully “classifies” such operations in the name of National Security. The Unconventional Warfare document from 2008 is likely as close as we’ll ever see the government come to admitting that they use terrorists as surrogates in Psy-Ops. There it is in black and white. DHS and the SPLC can eat their hearts out, eh? Before the FBI could stop them, local TV stations with film crews on the scene were broadcasting all over the country those very films you just saw. By that afternoon they were all “gone”. Go figure, eh? The point is that Timothy McVeigh was a “surrogate”, a useful idiot being prompted (handled) by government employees (agents provocateur) involved in a major black operation which was designed to further strengthen NATIONAL POWER over the domestic part of the Human Domain. 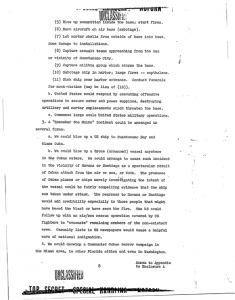 Also known as a “false flag” event, the bombing of the Murrah building in Oklahoma City was a psychological operation, a deadly Psy-Op which would predispose the American public to call for tighter “Security” and to become willing to give up yet more of their personal liberty in exchange for that additional security. This was done in what planners considered to be the “national interests”. 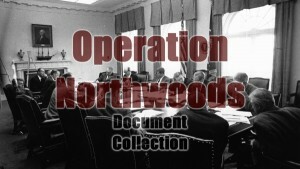 (Note: The active link for the Northwoods Document is: http://nsarchive.gwu.edu/news/20010430/northwoods.pdf ) If you have never read this document, by all means read the whole document now. It is a fairly brief document and will chill your blood. This was written by the Joint Chiefs of Staff and sent to the Secretary of Defense, Robert S. McNamara, to present to President Kennedy for approval. It’s now an undeniable part of American history. 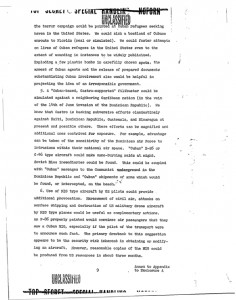 And yes, as the document shows, even as far back as 1962 the military had “drones”, could fly airplanes from ground-based controls. And even in 1962 the Pentagon conceived blowing up buildings in Miami and Washington D.C. and blame the “terrorism” on Cuba, as part of a massive Psy-Op to cause the American people to support the desired war against Cuba. Read the whole document — it’s an eye-opener, and it’s “real”. To “Map the Human Terrain” of the American people this insane “exercise” called JADE HELM 2015 unabashedly declares that it shall be an Unconventional Warfare drill conducted (with township, County, and State “permission”) right here on U.S. soil. Let’s take a break and view this very interesting revelation by C-SPAN, which poses a valid question — Why on earth would the military need to train on U.S. private and public land when the taxpayers have paid through the nose to erect, on an actual military base, a perfectly suitable training area for such activity? From above-linked article: A mock city roughly the size of downtown San Diego has risen in a remote Southern California desert to train military forces to fight in urban environments. With the Asymetric Warfare Training Center at Fort Hill on the East Coast and the massive Urban Warfare Training Center on the West Coast, we must ask if the Pentagon has lost its mind. They’ve blown a whole lot of taxpayer dollars to create, on military bases, the very sorts of training environments needed to prepare our troops for operations anywhere on earth, yet they now claim that those expensive bases are no good for training after all, which is why (according to the Pentagon) our military now must train on private and public property in the civilian domain, in our towns and cities and rural areas. The truth begins to materialize in front of our befuddled minds. 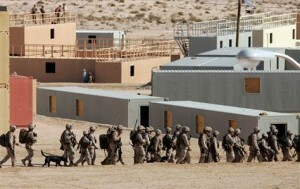 They are planning to train our military for upcoming operations right here in America, on U.S. soil, obviously. Civil Affairs soldiers are the commander’s link to the civilian population and authorities in an area of operations. In addition to their military training, Civil Affairs soldiers possess skills and experience based on their civilian education and employment in fields such as finance, public safety, public health, and public utilities. With their unique skills they support the commander during combat operations by minimizing burdens or liabilities caused by a local civilian population. Immediately following hostilities Civil Affairs soldiers reconstitute civil authority, and in the longer term help rebuild a viable civilian infrastructure and economy. Civil Affairs supports U. S. national objectives by assisting the government of a host or occupied area to meet its peoples’ needs and maintain a stable and democratic civil administration. 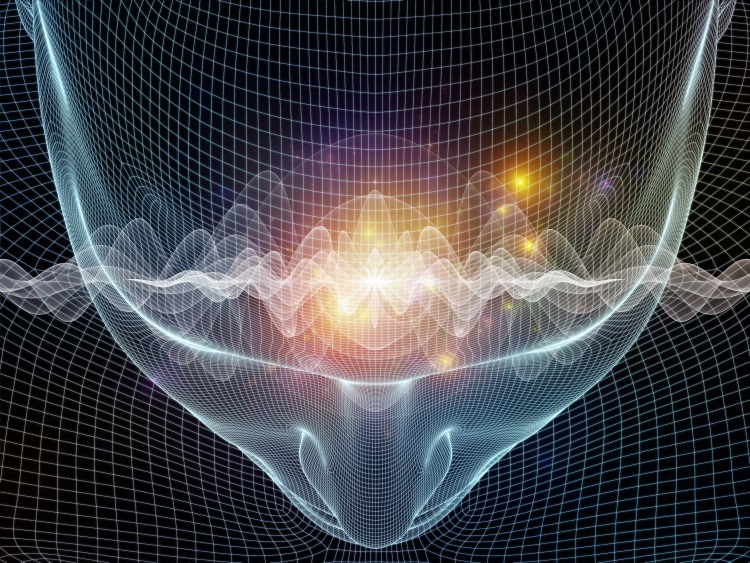 Psychological Operations (PSYOP) uses persuasion and public communication to influence perceptions and encourage desired behavior among foreign target audiences. The cornerstone of PSYOP is truth, credibly presented to convince a given audience to cease resistance or take actions favorable to friendly force intentions. PSYOP soldiers provide the commander with the ability to communicate information to large and small audiences via face-to-face, radio, television, internet, print and/or other forms of media. Their language skills, cultural awareness, regional orientation and knowledge of communications media provide a means to deliver critical information to a target audiences [sic] to achieve the desired effect. Civil Affairs and PSYOP units provide support to theater commanders to assist them in meeting their global commitments. But Civil Affairs is a sister to Psychological Operations, and both are integral parts of Unconventional Warfare as well as being arenas in which JADE HELM 2015 will function in our towns and States – with Psy-Warriors dressed in civilian clothes. 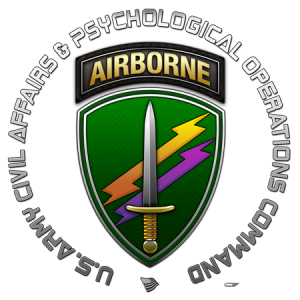 Did you catch that line about “Psychological Operations (PSYOP) uses persuasion and public communication to influence perceptions and encourage desired behavior…”? 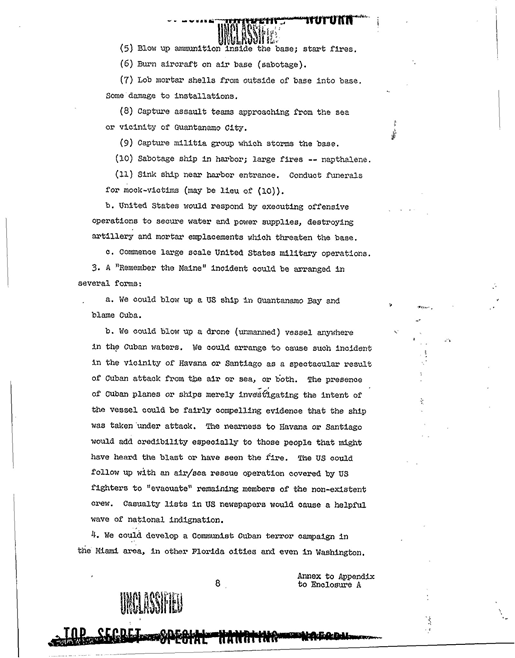 While the Army is always careful to use the implied disclaimer stating that all such mischief is targeting “foreign” countries, as if to suggest to inquiring minds that the Army would never do such trickery against the American people, we yet recall the two leaked documents from Homeland Security from 2009, and we add this scenario from the infamous Colonel Benson over at Fort Leavenworth, who decided to take DHS seriously and devised a training scenario in which “Tea Party” civilians in South Carolina were the “enemy”. A right-wing militia inspired by the Tea Party movement has taken over the city of Darlington, South Carolina, arrested the local government, and declared that the federal government should be overthrown. As the militia establishes checkpoints across I-95, other extremist groups across the nation rush to declare their support. South Carolina’s governor – a Tea Party supporter – declines to send in law enforcement to quash the militia, but quietly asks for federal intervention. The President invokes the Insurrection Act to authorize the use of federal troops, as the Pentagon prepares for war at home…. Benson and Weber boldly argue that “if we face a period of persistent global conflict as outlined in successive National Security Strategy documents, then Army officers are professionally obligated to consider the conduct of operations on U.S. soil.” They also argue that preparations for such a scenario must begin now, including proper equipment for the U.S. military as well as liaison between federal and state authorities. How does that jive with the two DHS leaked documents I noted above? Mapping the “Human Domain” has long been a sales item for the worry-warts over at the Southern Poverty Law Center (SPLC), the anti-Constitution group which sells profiles of the American people to DHS and the Pentagon and at the same time trains “law enforcement” around the country. The SPLC, DHS, DOJ, and the DOD are all playing mind games with the American people, and now they’re caught at it.